The game of carrom board was introduced to me by my grand mother. She had an antique carrom board in her house. My cousins Robby , Seelan and I were taught to play this game by our grand mother. She used to play with an ivory striker. Now a days Ivory strikers are banned and we have only plastic strikers. Before playing the game, we would sprinkle boric powder on the board and make it suitable for playing. My grand mother was unbeatable in this game and we have tried many a time to beat her; but failed all the time. The only trick that I adopted to win the game was to steal the coins when no one was looking. That trick does not work when I do not pocket even a single coin. But it works if you can convince your cousins that you did indeed pocket a coin. Time flew by. My cousins and I got married and our wives became more responsible. 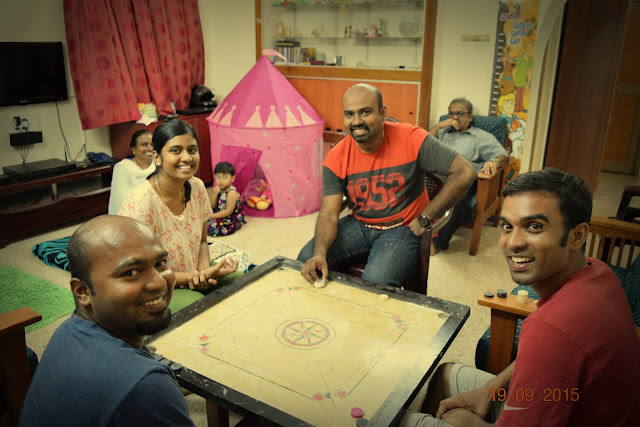 We met over the weekend and we decided to play a couple of games of carrom board. So the brothers (Robby and Seelan) joined hands and formed a formidable team. They called themselves " Lodukku Pandis". They were up against Blessy and me. Blessy is Robby's wife. We called ourselves "Good People". In the first game Blessy and I decided to let Robby and Seelan win the game because we were the good people. So the lodukku pandis won the first game. In the second game, the good people decided to play to our strength and ended up blanking the lodukku pandis. In the third and deciding game, Blessy and I started thumping the brothers; but suddenly the Lodukku Pandis won. I think they flicked the coins when we were not seeing them. As we were the good souls, we did not create big fuss over this incident. Robby is wearing Blue t shirt; Seelan has 1952 on his shirt.This picture was taken during the third game and this is when the lodukku pandis flicked the coins and won the game.